I have a baby shower to attend and wanted to make a card but had "writer's block". So, I decided to check out some ongoing challenges and got some inspiration from those. I've often looked at the Cupcake Inspirations Challenge ,but have never entered it. Today their cupcake was perfect for my project! 2 Sisters Challenge Blog (use stitching). One day I might try real stitching - not quite that ambitious yet! Crazy 4 Challenges (use stripes and polka dots). Desert Island Crafts Challenge (I used # 1, 3, 6, 7, 8, 9 and 10). At first I thought you had to use all the items on the list, and was relieved when I realized you didn't. I LOVED having a recipe to follow - really helped pull my project together! I was using all browns, but added some green for the challenge and love it! Where do you all find the challenges you participate it? Do you keep a list? 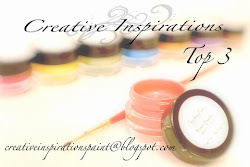 I have just depended on a list my sister (Crafting Misfit) has on her blog. Does anyone else have a good link to different challenges? Lovely! Thanks for joining us at 2 Sisters Challenge Blog this week! These are cute! I love Create a Critter too:-) I need to get it back out! I have a something for you on my blog. Hop on over and pick it up, it's in the top post.